The Tampa Hillsborough Expressway Authority (THEA), with the support of the US Department of Transportation, is installing a connected vehicle (CV) pilot program that will combine vehicle-to-vehicle (V2V) and vehicle-to-infrastructure (V2I) technology on ten electric streetcars that run in Tampa's central business district. GPS and dedicated short-range communications (DSRC) antennas systems will monitor the streetcar's position and will broadcast an alert to the streetcar, nearby traffic signage, and the dashboards of CV motor vehicles if the systems sees a motorist intending to turn in front of the oncoming trolley. 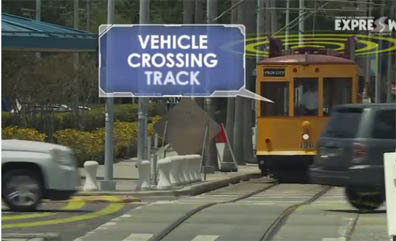 Hardware and software operation are now being tested in Tampa, and the parameters of the warning algorithms are being tuned so that warnings provided to streetcar and automobile drivers give sufficient time to take appropriate actions.